Carrizozo's Heritage Museum is open from 10am to 2pm each Thursday through Sunday from March through November. 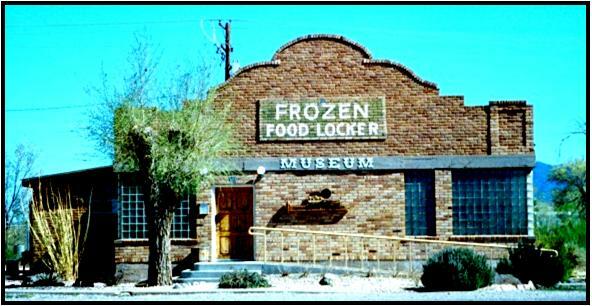 The building shows how things used to be in Carrizozo and Lincoln County when it was built in the 1940's to be a frozen food locker and ice plant where ice was made and sold for home iceboxes. Residents also rented lockers to keep the frozen food - game from hunting or to keep the locally butchered livestock. Abandoned in the 1950's, the building opened as a museum in 2003 and exhibits railroad and ranching history, including: a 1930's ranch kitchen; an early country schoolroom; a 1905 Barber Shop; a Milady's Millinery Shop; a Western area with saddles and tack; and a homesteader's log cabin. A gift shop is available with books on local history, Southwest cooking and children's stories. The building next to the Museum was built as an electric plan in 1938 and now features railroad memorabilia and a chuck wagon and mining exhibit.